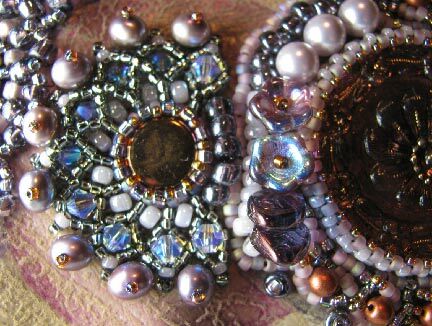 The major design elements of my new necklace were overlapped bead embroidery motifs that I developed from popular bead weaving stitches. 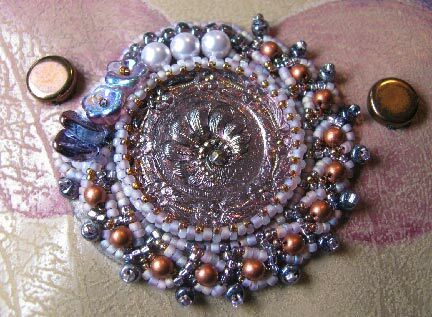 In choosing what motifs to place where, I had to take into account that some patterns were dependent upon a specific bead count, while others could be a bit more flexible. In several cases, I knew that my motifs would not wrap completely around the focal bead, either because there wouldn't be enough room with the overlapping, or just because I didn't want them to. 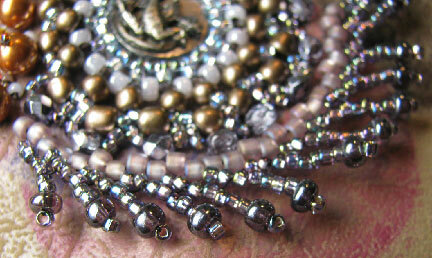 So bead count helped to determine placement of the motifs, but the complexity of the pattern was equally as important. 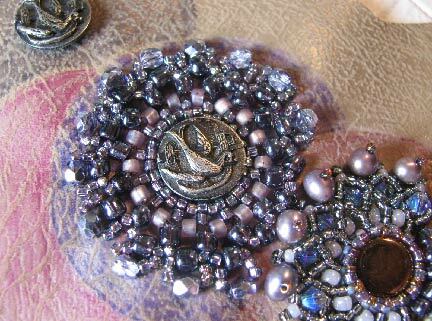 The more embellishment possibilites in the pattern, the more likely it would be to appear closer to the middle. 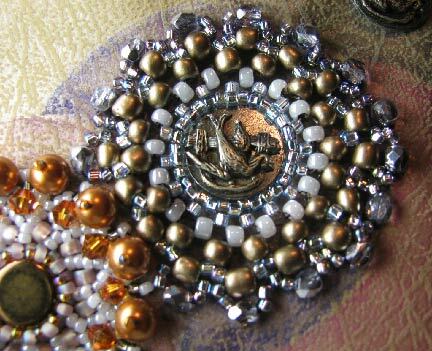 I also needed to choose motifs for near the back of the necklace that would look good being stitched on a smaller scale. Although I don't always do this, this time I decided to force the spacing to stay as planned by stitching down all of the focal beads before anything else. As I got started, I chose the African Helix motif (instructions found in Bored By Back Stitch) for the center and worked outward from there. 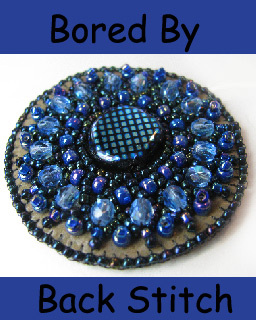 The "matching" circles on each half of the necklace would have the same bead stitch motif, but they would be done with different beads in a different colorway. While my color palette was fairly limited (gray, grayed lavender, and copper) the possibilities for combinations seemed more numerous than I had at first expected. The next motif out from the center on each side was an embroidered Chevron stitch. And next came Right Angle Weave (RAW) motifs. 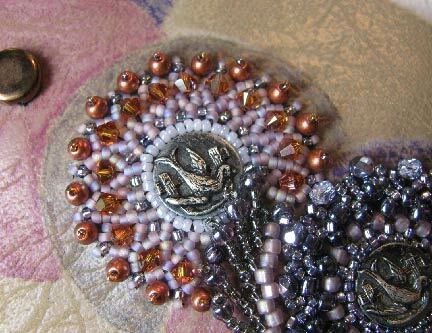 I added St Petersburg Chain stitch as a fringe element next to, and slightly below, the RAW motifs. I decided to double up on Chevron stitch, making the next motifs in contrasting color patterns from the ones closest to the center. These four motifs, African Helix, Chevron, RAW, and St Petersburg Chain, plus eight more, are all taught in Bored By Back Stitch. 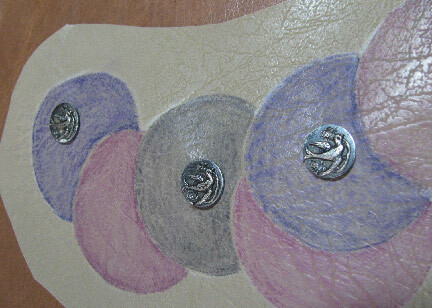 Next time, I hope to show you two more motifs, which will (probably) be Russian Spiral and Peyote.